PieSync Help Center - Can I sync objects such as Deals/Tasks/Invoices/Opportunities/Notes/... ? All Categories ​>​ FAQ ​>​ Can I sync objects such as Deals/Tasks/Invoices/Opportunities/Notes/... ? In short, no. PieSync currently syncs CONTACTS only. Syncing Deals, Tasks, Invoices, Opportunities, ... (app-dependent) is not yet available as these are different objects/entities from a syncing perspective. PieSync's next big upcoming feature Relations will include syncing Companies (Q3/2019). Afterwards, we'll gradually enable the possibility to sync related objects. First Phase: Enriching contacts by taking information from the contact related object/entity such as the deals/tasks/invoices/... to enrich the contact information via rules and mappings. We will not be able to create and link contacts to them during this phase yet. Second Phase: Creating different objects/entities such as deals/tasks/invoices/... In this phase, we won’t be able to keep e.g. a deal in sync with a company or task just yet. It still needs to originate on the contact level. Third Phase: Syncing contacts with contacts, companies with companies etc. while maintaining the relation/link between them. Can I Sync Accounts/Companies/Organizations with PieSync? Can I sync my contacts' avatars? But I need this today! 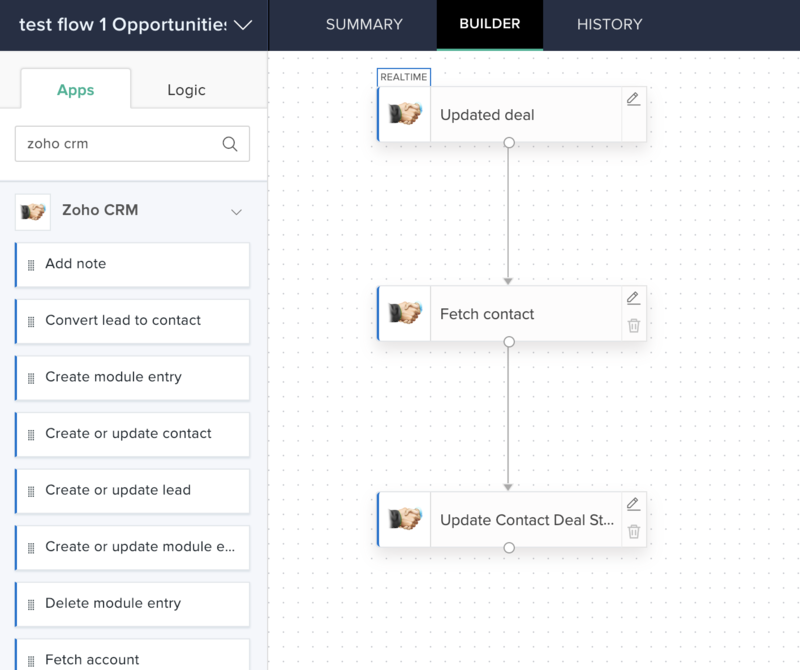 Advanced CRM software like Salesforce, Pipedrive, Zoho, or HubSpot allow you to move data across objects. Bring over data from an opportunity or an account onto the contact, so it can at least be used as a filter. We cannot exhaustively document how this works for all CRM's, but here's a couple of examples to inspire you. If your need is short-term and your own software does not allow for information to be moved across objects, perhaps Zapier or other integration software can help bring over some information? Watch the video below to find out how.